TULSA -- After more than a decade at their downtown location, Tulsa Glassblowing School is packing up and moving, hoping to light a fire into revitalizing a local park. "When we went to look at it, it was like, when you walk into a space and you know that’s the right place for you, we just all had that feeling," said Janet Duvall, Executive Director of Tulsa Glassblowing School. You may be inches away from flames, but glassblowing can be therapeutic. "It allows people to really focus and kind of get outside of themselves for a little while," said Duvall. Officials at Tulsa Glassblowing School said at first their 1,800 square foot building served them well. However, over the past few years things have been getting cramped. "We’ve been looking for the last four or five years trying to expand that space because we feel like we’re just on top of ourselves," said Duvall. Their main mission is "changing lives through glass art" which they do with their fairly new military veteran program, VETri. The program is designed exclusively for military veterans that allow them to work with others who have shared similar life experiences. According to the school, 82 veterans from the Vietnam War to more current conflicts have participated with four of the five branches of the military being represented. 91 percent of veterans who complete the first six weeks end up finishing the entire 24 week program. A second weekday session was created to accommodate demand, which is over 100 veterans. Tulsa Glassblowing School also partners with 30 school districts and youth organizations in the Tulsa area. Their Glass in the Class program promotoes STEM subjects that directly relate to glass art in the classroom. "Now they’ll bring a bus load of 60 kids and obviously that doesn’t work here so we’re always having to split them up," said Duvall. After years of searching, they decided to fix up and move into the vacant recreation center at McClure Park. "The walls and everything are in great shape and actually this building, the electrical, the mechanical, and plumbing are all still functioning but the roof has almost completely failed," said Anna America, Director of Tulsa Parks and Recreation. The building needs a lot of work, but officials with the school are hopeful they’ll open doors at the park sometime in the late summer. "The building will still be owned by the citizens of Tulsa, so this will still be our building but Tulsa Glassblowing will be investing private money in improving our assets, so I think it’ll be a win for us and a win for them," said America. Annual utilities, even with the building closed since 2015, run the city about $8,500. 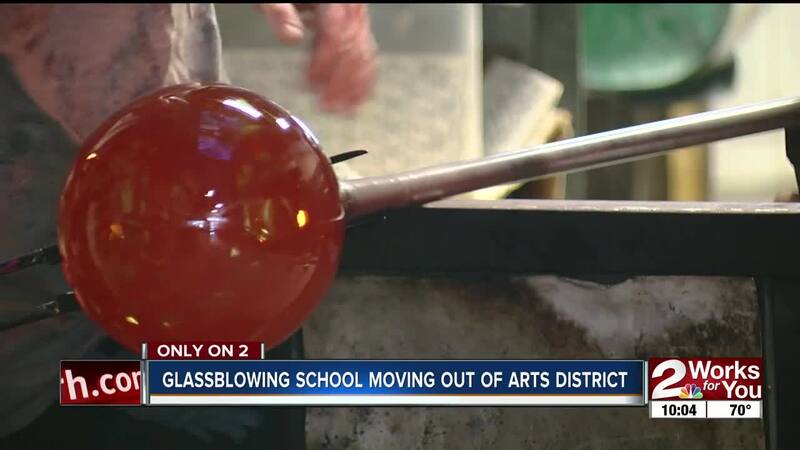 With Glassblowing School taking over, they'll save taxpayers that much money every year, while breathing life back into the community. We'll keep you updated when they finalize a date to close their downtown location and open their school at McClure Park.